Let's say there's a ball and a (physically ideal - no friction etc.) robotic arm situated in otherwise empty space. The arm takes the ball, moves it around in a circle, and then returns it exactly to where it started. The arm also returns to its starting position. In this case, there is no displacement overall. The ball and the robot arm are in the exact same positions as when they began. Thus, $W = F\cdot 0 \cdot \cos\theta = 0$ So no energy was required to move the ball in a circle. However, this disagrees with my intuition, because if I were to make a robot arm that would do this, I feel like I would need to give it an energy source (for example, a battery), and that by the time the robot was done, I would have lost energy from that battery. Many objects move in circles without needing any energy. This starts with stuff like geostationary satellites, continues with moons that orbit planets, goes on to planets orbiting stars, stars orbiting other stars or black holes, and stars orbiting their galaxies' center of mass. All of these perform thousands, millions, and billions of rotations without any need for energy. Of course, these objects all need to have sufficient kinetic energy to be able to orbit in the first place. An object that's stationary with respect to earth, will just fall down. To get it to orbit earth, it must be accelerated first, and that needs energy. And if you want to get it stationary again after it has completed an orbit you have to decelerated it again. However, while the object is orbiting on a circle, its kinetic energy remains the same all the time, no energy needs to be put in or removed. However, that's not the entire story. Because, when an electrically charged object goes in circles, it emits electromagnetic radiation. 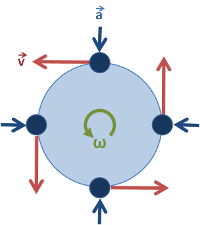 A circling charge induces a magnetic field. That is what happens in any electric motor, including the one that spins your computer's fan right now. The reverse process works as well, a changing magnetic field accelerates charges round in circles. That's the working principle of any electrical generator, including your bike's dynamo. You can move stuff around in circles without needing energy, as long as the object is not electrically charged, and losses to gravitational waves are negligible. Which is pretty much always the case. And, at least for the electro-magnetic effects, you personally rely on them every single day. First, you are not equating the work done correctly. This is a good physics lesson. Please understand your equations before you use them. Blindly plugging in numbers will not work out. The equation you give is only true for motion in one dimension and with a constant force. Plugging in $0$ for displacement is not correct here. In general you need to look at infinitesimal displacements $\text d\mathbf x$ and calculate the work $\text d W=\mathbf F\cdot\text d\mathbf x$, then integrate (add up) the total work. Now, I am assuming the ball starts and stops at rest. Therefore, the arm does work to increase the ball's speed, and then it does the same amount of negative work to bring it to rest. So the net work is $0$, but it is because the total change in kinetic energy is $0$ (since $W=\Delta K$), not because the displacement is $0$ around the circle. Now, this is not the same thing as the robot using something like a battery. The robot (neglecting friction) has to apply forces to change the speed, and this requires power from the power supply. Just imagine yourself doing the action of the robot. You will need to exert effort to get the ball (and yourself) moving, and you will need to exert effort to get the ball (and yourself) to stop rotating. Does the movement require energy? If you are considering cases where the motion includes some components downward in relation to gravity and some components upward, not every robot will be designed to recover the energy gained by moving downward and use it to move the object back upward, so some energy will be used lifting the object on the upward part of the path. If we can neglect external gravitational or electromagnetic fields then we only need to consider the kinetic energy of the ball. This is zero at the beginning of the motion and zero at the end, so the net change of energy in the ball is zero. If we assume an ideal robot arm (no friction, perfect conductors, no air resistance etc.) then the energy that the robot arm puts into the ball to accelerate it at the start of the motion can be 100% recovered when the ball decelerates at the end of motion. So the net loss of energy from the robot arm is also zero. In practice the robot arm will lose energy due to friction, resistive heating, air resistance etc. Recover back all potential (lifting up the load) and kinetic (accelerating the load from zero initial velocity so it can be moved) energy without loss. A simple electric engine can do this, but obviously not without loss. Move the load without friction (well, you have stated in the question that your robot can do this, but even spacecraft do hit atoms on their way through the vacuum). The robot will need energy in general, especially if the circle stands vertically like a Ferris wheel. Only an ideal robot would be able to recover all the energy back at the end of the loop. A great example of such a machine is the Buzz Aldrin cycler. It is a "space bus" that travels between Earth and Mars essentially for free because it travels in a closed loop. In space, it is relatively easy to satisfy the two conditions above in a significant degree. If the robot arm is extended holding the ball and rotated horizontally, then the energy required would be calculated using torque, using the distance of the centre of mass and the total mass being moved by the motor. Therefore, if we say the arm takes 1 second to complete the circle, the power required is 10 x 2 x pi x 1 = 62.83 Watts (= joules/sec). A typical stepper motor for a robot arm with a reach about 1m would draw 12V, therefore would have to be rated at 6A which in a perfect system would be capable of delivering 72 Watts. The infinitesimal work on an object is $Fd\cosθ$. If any of those quantities aren't constant, then we have to take the integral over some path. However, all paths will the same starting and ending conditions will yield the same answer. If the ball ends up in the same condition that its started in, then it hasn't had any work done on it. So this is not the central issue. What is the central issue is that this is the formula for doing work on an object. Just because the robot arm has done zero work on the ball, that does not mean that the robot arm has expended no energy. It just means that none of the energy expended by the robot arm has gone towards permanently increasing the kinetic energy of the ball. The robot arm could have expended energy otherwise, such as overcoming friction in its internal mechanisms. If the robot arm accelerated to move the ball, and then decelerated to stop the ball, then it took energy to accelerate, and then the energy went somewhere when the arm decelerated. If the deceleration happened through friction, then the energy dissipated into heat. But the robot arm could have regenerative braking, in which case some of the energy went back into the battery. In any real world system, there will be some loss of energy to heat. No motor and no regenerative braking system operates with perfect efficiency. But in an ideal system with no friction or other inefficiency, the robot arm could indeed move the ball and end up with the same amount of energy in its battery, and thus this would not use up any energy. However, we would still have to have some energy to start with to power the system, even if that energy isn't used up. So if direction of movement changes, speed changes also. And if speed changes - there MUST be a force acting upon an object. And for keeping force, you need an energy of course. Not the answer you're looking for? Browse other questions tagged newtonian-mechanics energy rotational-dynamics energy-conservation work or ask your own question. Does an opposing force cause loss/ waste of energy? What's wrong with this idea for recover energy from pressure? Kinetic energy for generalized coordinates?